A few days ago I found out that he had written a book called The boy who harnessed the wind - Creating currents of electricity & hope. 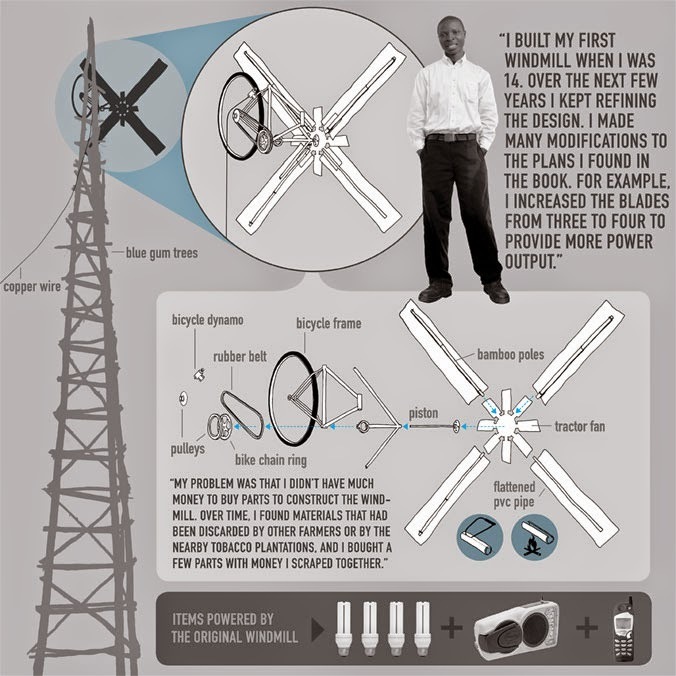 The book will not only tell you the story of the windmill, but also how he grew up and other technical projects he had. So the windmill is just a small part of the book. 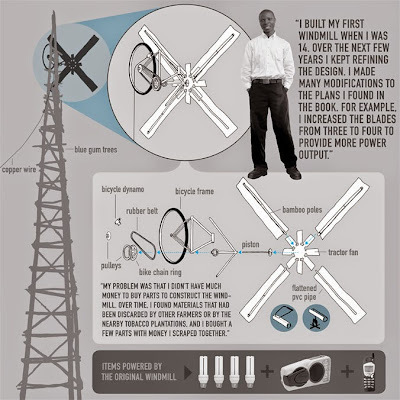 William Kamkwamba grew up in Malawi, which is a small country in southeast Africa. He grew up in a poor family and he lived in a small hut made of clay. They didn't have electricity, so he had to go to bed at 7 PM when the sun had gone down. The only option they had was to save money and pay the electricity company to install electricity, but they couldn't really afford it. Neither did they want to save the money because the electricity company in Malawi was know for its frequent blackouts. So what's the point of first save money and then not have any electricity anyway? When I say that William Kamkwamba grew up in a poor family, were are talking really poor. Like most families in the country, they had to grow corn so they could feed themselves. But when a harvest failed due to bad weather the entire country began to starve. It fell upon us like the great plagues of Egypt I'd read about, swiftly and without rest. As if overnight, people's bodies began changing into horrible shapes. They were now scattered across the land by the thousands, scavenging the soil like animals. Far from home and away from their families, they began to die. His family had saved some money, but they had to spend their last savings on food. The school system in Malawi is not entirely funded by taxes, so William Kamkwamba was forced to drop out of school. Because of the famine, only 20 out of 70 students could remain in school. Even the teachers were forced to spend their day searching for food. Luckily, William Kamkwamba and his family survived the famine. But they couldn't afford his student fees because of a series of unfortunate circumstances, so while his classmates could return to school, William Kamkwamba was forced to remain home. If he could build the windmill, it could rotate a pump for water and irrigation. This could mean that his family would never have to starve again, and he could get electricity for his home. But everything didn't go smooth. At one point, and because of the country's low education level, his neighbors wanted to tear down his windmill. The reason was that they thought it blew away the rain clouds. To not upset anyone, he had to stop the blades during the day. How to create water wakes in Unity? 2015 Update: Peak Oil - Are we there yet?